More on Jane: King’s College in Cambridge, England, has organized an exhibition in honor of the 200th anniversary of Jane Austen’s death. It includes rare artifacts such as a letter penned by the author and the manuscript of an unfinished novel entitled Sanditon. You guessed it–Jane Austen: Austentacious takes on London’s West End beginning this December. Prompted by a title of a “lost” (see: non-existent) novel provided by an audience member, the cast, dressed in regency garb, creates a completely improvised show. In the past, they have put on such shows as The Sixth Sense and Sensibility, Mansfield Shark, and Double O Darcy. No turning back: LA Times contributor Rosemary McClure provides a guide to celebrating the aforementioned 200th anniversary around the world. From Bath, Hampshire, and Chawton all the way to California, McClure’s pilgrimage spans two countries and several gift shops (gotta have that sweet, sweet Austen merch). 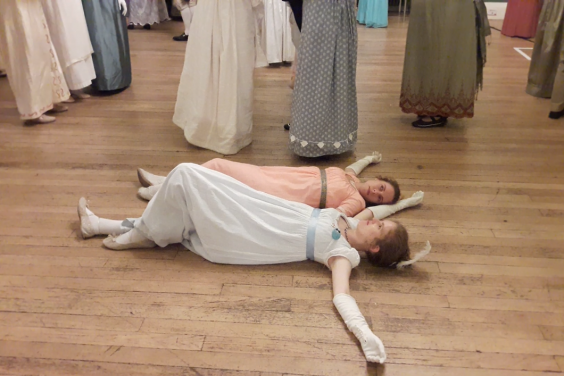 I guess this Weekly Round-Up is Austen-themed now: Janeites from all over the world gather–in period costume–to the Jane Austen Festival in Bath, which closes this Sunday, September 17. The cult of Jane Austen has a strong hold on its Janeites. Practice caution, Corelings. Be grateful that we read Austen in the spring. For now, we are safe from her iron grasp and compelling prose.